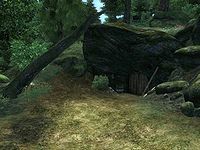 Sage Glen Hollow is a medium-sized cave northeast of Bravil containing conjurers. It contains two zones: Sage Glen Hollow and Sage Glen Hideaway. This cave contains 10 Cairn Bolete plants. 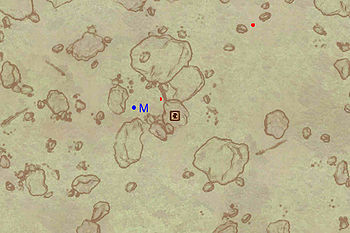 This location's map marker (M on map) is named Sage Glen Hollow (editor name SageGlenHollowMapMarker). The entrance door is ESE of the marker, 50 feet away. Sage Glen Hollow resembles other Conjurer dungeons in both size and contents, but a healthy amount of valuables and easy access to the boss leveled chest makes exploring it worthwhile. Upon entering from door Out, head down the hallway; going straight forward will lead you to a room with a sole enemy and no treasure, so take the right path, head north when you reach an intersection and claim the minor loot from the chest in the northernmost room. Backtrack to the intersection and take the narrow western passage and clear another dead-end room. 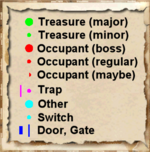 Backtrack again and head south until you reach a larger room with a bedroll at b, then make a choice; the eastern tunnel leads to door D, which allows you to explore most of the second zone, Sage Glen Hideaway, with the exception of the boss chamber; heading south through the room with the dead captive (F) will lead you to door C, and very easy access to the boss and his chest. If you chose to go directly for the boss leveled chest, you will arrive in Sage Glen Hideaway from door C. Head up the slope to the east and face the boss-leveled Conjurer at A, loot his alchemic laboratory (E) and claim the content from the locked boss chest at B. Nothing more to do here, so backtrack back to the door and re-enter Sage Glen Hollow. 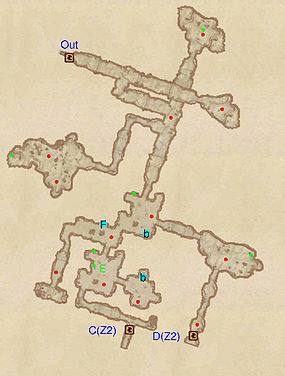 If you chose to ignore the boss for now, you will arrive in this zone from door D. Head south and emerge in a large cave and explore the two narrow paths in close vicinity of your arrival point; the northern tunnel leads to a chest and a bedroll at b, while the southern one contains a small alchemy lab, a chest and another bedroll. 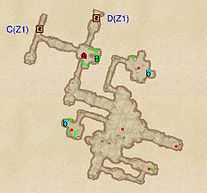 Finally, locate the small room in the southeastern area for the last minor loot chest, then backtrack all the way to door D and return to the first zone, Sage Glen Hollow.